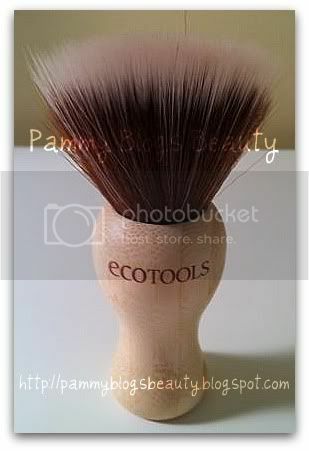 Since I totally love the whole ecotools line of brushes, I was delighted to see some "new" additions to the line! IMHO, ecotools are the softest brushes around (both drugstore and high end) and certainly the best quality that you can get at a drugstore price. Plus, they are environmentally friendly and cruelty free; so, bonus! So, here's a down-n-dirty review of my recent ecotools brush purchases! :) Enjoy! Might as well start with the newest item! This is such an interesting kabuki!!! I am not sure how long this has been out; but when I first saw it at Walgreen's it literally jumped right into my basket, lol! I just had to give this brush a try! I figure, with an Ecotools purchase, you can't really go wrong. More photos, comparisons, etc after the jump! This brush is a cross between a stippling/duo fibre brush and a kabuki brush. So, yah, if a kabuki had a baby with a stippling brush, this would be it. Tee-hee! For real, I have never seen a brush quite like this one! It has hairs in variated lengths and the brush is extremely wide (see comparsion photo below with pictures of all my other kabukis, all of which are less wide and more dense). While the package says that the handle is bamboo, it feels more like regular wood to me? It just isn't quite as shiny as the handles of my other Ecotools brushes. No matter though, the handle is cute! I like the shape and the flat base so that it stands up well. The hairs are talklon. I am sure it goes without saying that this brush is incredibly soft. It feels amazing on the skin!!! This brush was designed for powder, blush, or bronzer application. I personally find it *much* too large for a precise application of blush or bronzer (I tried, but nope!). But, it is great for *after* application of blush or bronzer to blend out (so use it clean after applying blush or bronzer with a different brush). 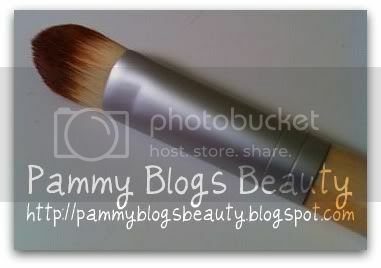 How I like to use it: I love this brush for applying either powder foundation or finishing powder. The bristles lack density at the tips so it is perfect for a very light application. I think it would be impossible to overdo your powder with this brush. You will get beautiful light coverage. Which is just how I like it for powder!!! I think it is best suited for loose or finishing powder (hmm, finishing, hence the name). If you want more coverage out of your powder foundation, you are better off using a regular kabuki brush that has more density like the Ecotools Retractable Kabuki. 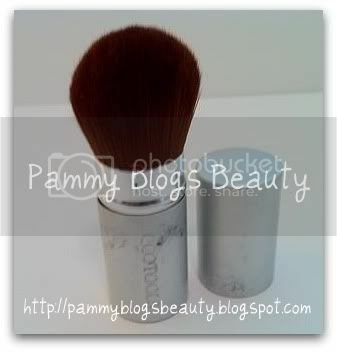 Just had to include a picture of the Ecotools Retractable Kabuki Brush! This brush *lives* in my purse (see the wear on the handle? I don't mind the wear. I think that metal develops such a beautiful patina with wear). I already reviewed this brush here, but had to give it a shout out as I still totally love and adore it!!! This is Ecotools newly designed concealer brush. I believe it came out a couple months ago and replaced the older version (which, I did not own, but IIRC, wasn't quite as fluffy). I am such a fan of the Ecotools concealer brush from my 5 piece brush set (I use that concealer brush from that set every day! ), that I had to pick up this full sized version. But, generally, I must admit...I prefer the shorter travel sized brush better. For the primary reason: I like getting "this close" to the mirror and travel size eye brushes allow me to do that. When I use the longer one, I find that I keep bumping into my mirror, lol! I am lucky I haven't "poked my eye out". Just kiddin! I am sure it is just whatever you are used to. The full sized brush is much fluffier that the travel version. So, depending on what concealer I apply, I might use the smaller or larger brush as they do apply the product a bit differently. 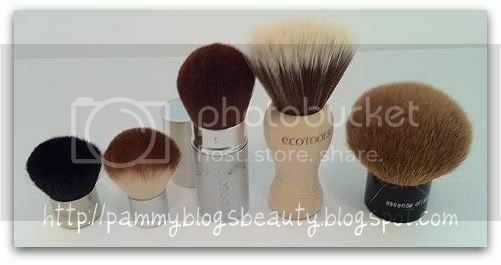 Ecotools lovers, what are your fav brushes from this line? Thanks so much for reading!!! wow that stippling/kabuki looks really neat, reminds me of the mac 180 was it with the handle like that, but the head is like a stippling brush. Definitely will keep an eye out for that. Great review of both brushes. I haven't tried any of their brushes although I have been meaning to test them out. I love the look of the bamboo finishing kabuki. The shape reminds me a lot of my grandpa's old shaving brush that he used to put shaving cream on his face. I love that it has a flat bottom for standing up and think its definitely the kind of brush you'd want to display. The concealer brush also look really nice although I usually like a more pointed concealer head so I can apply concealer to small areas with blemishes. This one would probably be good for applying under eye concealer though. Will definitely be picking some up the next time I am in the US. @Priscilla-Thanks girl! And thank you for *always* being so supportive of my blog! You rock girl!!! And, you would totally love the retractable kabuki for your purse! :) I really think the size is ideal for powder application. Hey Stavroula! Yes, I continue to be impressed with ecotools!!! 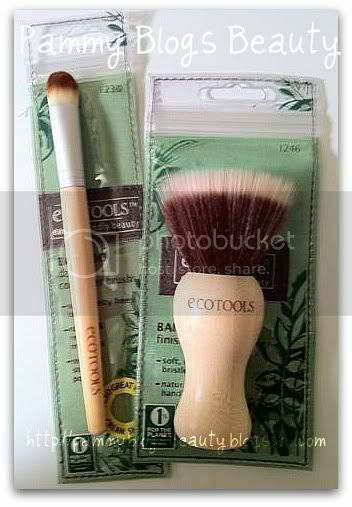 I love them so much that I am going to include some ecotools items in my next giveaway! :) I am waiting to get to 500 GFC followers before I post my next giveaway! And, lol, it totally looks like an old fashioned shaving brush! 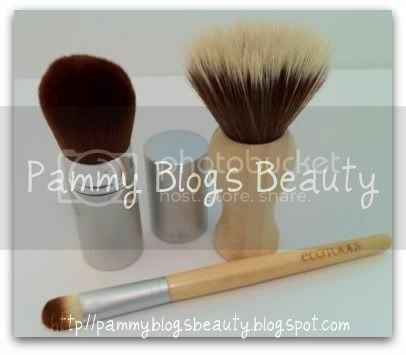 Just stumbled across this post, but I have the original concealer brush from ecotools. I have quite a few of their brushes that I got 3-4 years ago and love them! I still use 3 of them every day, no matter what. They've held up great and I've never had any problems with them. Would definitely recommend.